A few weeks ago, we went to Havana. 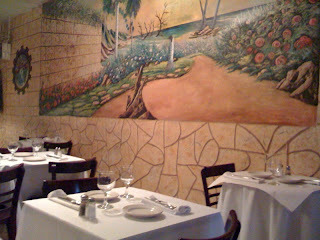 Little Havana on 30 Cornelia Street. We're glad we got there early since the tiny restaurant has only about 7 or so tables. The one tiny restroom was in the equally tiny kitchen in the back and so we were able to get a glimpse of the three cooks hard at work - a woman in her 70s with salt and pepper hair (the owner and chef Lidia Sharpe) and two young males assisting her. 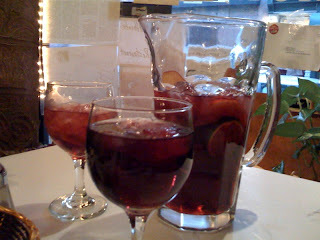 This is the best Sangria we've had a restaurant anywhere. It's so delicious that a pitcher for two people is very necessary. It had the perfect amount of sweetness and alcohol. 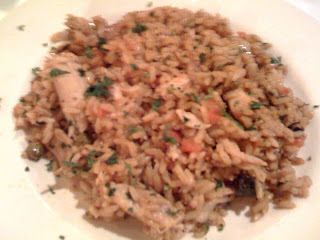 Arroz Con Pollo - saffron rice blended with special spices, chicken and dry wine. This dish was fantastic! We're not sure what the "special spices" were but they were something unique and flavorful in a subtle way. The only problem I had with this dish - the tiny portion. It was like being teased. I was still starving after I licked up the last piece of rice from the plate. 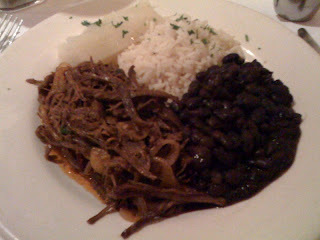 The traditional Cuban Ropa Vieja - cuban style shredded skirt steak with black beans and white rice. The beef was perfectly cooked, not rubbery or tough. The seasoning was also perfect, not overpowering or too spicy. All in all, nice, juicy and tender. Again, the only problem was that the portion was too small for our appetites. 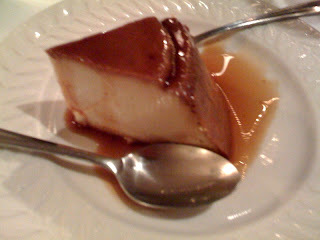 It's always hard to pass up flan, but surprisingly there was nothing special about this one. As we mentioned, our true test of how much we liked the restaurant is determined by whether we'd go back there anytime soon since we have so many other restaurants we need to try. We'd definitely go back there soon. And this was our view walking to the restaurant. And this was our night sky views walking back home. Not a bad night.